Kim Jong Il, the leader of the free world, has decided to move on to more fertile grounds, leaving with us just the memories of 8-color rainbows, singing Korean women and couple of nuclear weapons. But who was this man whose next ambition would have been to get the next Nobel Peace prize? Here are just a few facts you should know about. 2. In 1978 he kidnapped two South Korean film directors because in his mind all the filmmakers in his own country were just awful. 3. His favorite movies were Rambo and Friday the 13th. 4. A former chef claimed that his staff had to make sure the grains of rice He ate were the same size and color. 5. Kim was the world's best golfer. Based on an official government handout he celebrated his 62nd birthday by demolishing a par 72 course in just 34 strokes, during which he also managed to do five holes-in-one. He said it was the first time he had actually played golf. And there were witnesses, all of his 17 bodyguards verified the claim. After completing the game with a all time world record he decided to retire from the sport forever. 6. Kim had the power to control the weather with his mood. 7. In 2004 he claimed to have invented the hamburger. 8. In 2007 Kim was told by his doctors to quit smoking, while doing that he put a nationwide ban to smoking. 9. He managed to write six operas in two years. 10. At the same time, he also wrote 1,500 books. 11. Kim learned to walk, according to official records, when he was just three weeks old. 12. And he learned to talk while being just eight weeks old. 13. During the 1950s he built an entirely new city called Kijong-Dong. The city was designed for propaganda only. To this day it has no residents. 14. Kim he never pooped. Never. The official biography states that Kim does not answer to bowel movements like ordinary humans – in fact, he doesn't defecate or urinate at all. 15. According to official statements, he was a worldwide fashion icon. 16. Kim also cured dwarfism, short people were no more, even though Kim himself was just 5'3". The vaccine to dwarfism meant deportation of short people to uninhabited islands. 17. Kim kept up a youthful appearance by regular injection of virgin human blood. 18. He feared flying, so he just used train for really necessary travels. 19. He Loved Water slides according to some satellite images of his mansion. 20. According to one report, Kim forced waitresses at restaurants visited by many foreigners in Pyongyang to have cosmetic surgery in order to appear more "western". 21. He imprisoned relatives of convicts because he was convinced that "the stain of criminality" persists for three generations. 22. Kim produced a patriotic 100-part documentary series on the history of his North Korean homeland and he also wrote a book called On the Art of Cinema. 23. Until 2003, Kim Jong Il was the only person in the country allowed to have email access. 24. According to foreign analysts, Kim Jong-il was involved in at least two acts of state-sponsored terrorism. The first being a 1983 bombing in Rangoon, Burma, leaving 17 South Korean government officials dead. And the second, a 1987 bombing of Korean Airlines flight 858 that killed all 115 people on board. 25. 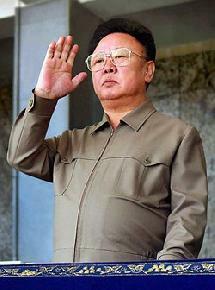 His father was named "Eternal President" at this death, so Kim Jong Il never officially became president of North Korea.